Carrots … cheap, readily available, invariably liked by children. And now, a cancer-busting superfood to boot. Research into carrots has shown them to: lower the risk of heart attacks in women; reduce the risk of coronary heart disease by 32%; reduce the risk of colon, prostate and bladder cancer; restore vision; and help prevent inflammatory diseases like arthritis. Carrots are also rich in a wide range of vitamins (specifically vitamin A) and minerals (read more at http://foodfacts.mercola.com/carrot.html). 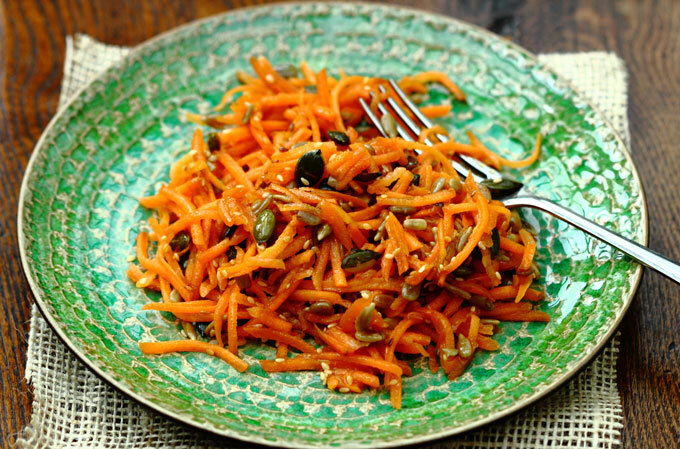 And although the beta-carotene is enhanced in cooked carrots, as it’s summer I’m giving you a favourite raw salad this week – easy and simple as ever. The pumpkin seeds add manganese, magnesium, zinc and iron; the sesame seeds add copper and calcium; and sunflower seeds are packed with age-defying vitamin E and B1 (thiamine). All three seeds contain protein and essential fatty acids, making this simple salad a veritable powerhouse of nutrients. While your seeds are toasting (I use a small cast iron pan), grate the carrots, using a food processor for speed. Make the dressing and pour it over the combined carrots and seeds. Feel free to add a grated raw beetroot which also works well. Simple, seedy and super-delicious and nutritious!